Why I made this project ? I had known for some time that several branches of my family had lived in Vilkaviskis, Lithuania, and in the surrounding towns for almost three centuries before the Holocaust. Last year I decided that it was time I saw these places for myself. To my joy, my eldest daughter, Rama, decided to accompany me. We went in August, 2006. Vilkaviskis had been of interest to me since, some time earlier, I had obtained a copy of a beautifully hand-drawn map of the Jewish part of town. The artist, I learned later, was a Dvora Dolev who had grown up in Vilkaviskis and had drawn the map from memory some time after she had left the town in 1937. 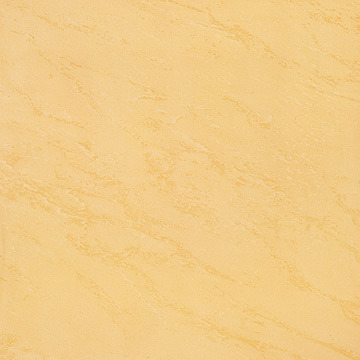 Its innocent charm captures the heart of all its viewers, recreating a world never to be seen again. Not only does it include a list of the town's landmarks but it also shows the location of the homes and the surnames of what must have been every Jewish family in town. My mistake was to think that present-day Vilkaviskis bore some resemblance to Dvora's map. But almost the entire old town had been destroyed in the heavy fighting that had taken place there, and many of the streets were no longer to be found. I should have expected that, but I was disappointed, so much so that I felt the journey had been in vain. We went on to Berlin, where I found so much of my family's history so well documented that I made another mistake: I thought that there was little more to do in searching for my family's history. remained as testimonials to what had been once been a significant Jewish presence there. That presence danced before my eyes whenever I looked at Dvora Dolev's map. Something, I thought, should be done. I decided to return to Vilkaviskis, this time to the town's past, to explore a world that has disappeared forever. My first step was to see what information could be obtained from the Vilkaviskis Jewish Cemetery. Were there enough gravestones to justify another trip? Here I have to thank both Marcel Glaskie and Ron Katheryn, who contributed their knowledge. And I must acknowledge, as well, the permission to explore the question I received both from the leader of the Jewish community in Vilnius, Mr. Simon Gurevichius, and the Mayor of Vilkaviskis, Mr. Algirdas Bagusmskas, for the land once comprising Vilkaviskis' Jewish Cemetery is now the municipality's property. The cemetery of interest, known to the Jews as the "new" cemetery, was in use from 1875 to 1942; there is an incorrect sign designating it as the "old" cemetery, even though an older cemetery is nearby, of which nothing remains but a few weatherworn stones sticking out of the ground. Sometimes Gentile friends asked us where Jews are buried now. No Jews are left in towns like Vilkaviskis. I floated the idea of another trip via the Litvak SIG noticeboard of JewishGen. Among the first replies was one from Carol Clapsaddle in Jerusalem, supportive and encouraging, and leading, eventually, to my acquaintance with Dr. Wayne Frankel of Bar Harbor, Maine. Wayne's family roots in Vilkaviskis were considerably more extensive than mine. With the help of members of his family, residing both in Israel and the U.S., Wayne collected some information about and photographs of the town, and made his appetite for more very clear. He also had a copy of Dvora's map, and as I had done for my Salingers, he had noted the locations of his Frankels' homes and places of business. He was eager to learn what, if anything, remained and what might be gleaned from the cemetery's extant gravestones. Eventually, to my delight, Wayne decided to join the expedition and became my partner. The network kept growing. I made contact with Mr. and Mrs. Menachem Oppenheim, through the kindness of their daughter Miriam. Menachem was born in Vilkaviskis in 1914. Listening to his description of life there heightened my enthusiasm for the project even further. Later I met Mrs. Dvora Dolev who had drawn the inspirational map of pre-war Vilkaviskis. She was now 91, but her memories were crystal clear. Her daughter, Miriam Cohen-Gil, has also been a source of constant support. And I must also acknowledge the advice and experience of Olga Zabludoff, who had the advantage of having worked on projects similar to mine, and whose support was always much appreciated. Using the information available from the Yad Vashem's "Pages of Testimony," I was able to construct at least a partial list of prewar Jewish residents of Vilkaviskis, some 950 names. The number of Jews murdered in Vilkaviskis by the Nazis, mostly in one week in September, 1941, exceeded 3,000. I have also indexed Dvora's map to clarify who lived where in Vilkaviskis. 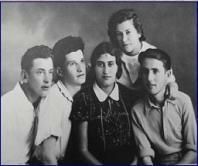 But the major obstacle to research on the Vilkaviskis Jewish community remains the lack of written records. Almost everything appears to have been destroyed during the Second World War and the Holocaust. Still, Beth Hatefutsoth, the Diaspora Museum in Tel Aviv, has a three-volume collection of photographs assembled by the late Israel (Soli) Sperling, one of Wayne's cousins, and by other former Vilkaviskis residents. (I am happy to acknowledge the Museum staff's patience during my several visits to the collection.) I have built an index of all those who appear in this collection of about 400 pictures of Jewish life in prewar Vilkaviskis. We drove to Mariampole where I had booked rooms for us at the Sudajiva. This hotel, although typically small in the European style, and not inexpensive, was very comfortable and served excellent breakfasts. I had decided that we would appreciate a little distance between the work in Vilkaviskis and our residence. So it turned out. The following day we met the Director of the Vilkaviskis Municipal Museum, Mr. Antanas Zilinkas, and his staff. I had been in correspondence with him and he had made his enthusiasm for our project evident. He had written to me that he had no real information about the vanished Jewish community, and I felt that it was our responsibility to help him discover a little of his town's Jewish heritage. We were greeted very warmly by Antanas and his staff, and we met several times over the next few days. On one of these visits he even provided a genuine loaf of challah, which his mother had learned how to make many years earlier from her Jewish neighbors. Not only were we touched by the gesture but we also enjoyed the taste. 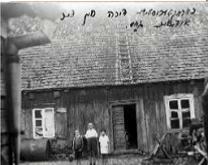 Beth Hatefutsoth had given me permission to reprint a series of pictures depicting prewar Jewish life in Vilkaviskis, and I had brought them, enlarged, for donation to the Municipal Museum. The photographs truly captured Antanas' imagination. There was, after all, a general awareness among local people that Jewish life had once been an integral part of the fabric of their town, country, indeed culture. But of the Holocaust and later Soviet occupation and repression of Jews and things Jewish, they know almost no details-which comprise the important stuff. Even though about 60% of Vilkaviskis' population had been Jews, and had been physically and functionally at the center of town, none of the Museum's exhibits gave any clues to this history. Those Lithuanians who, like Antanas--a historian--stopped to consider this found the photographs a revelation, as was clear from their eyes, expressions, and the treatment we enjoyed during the remainder of our stay. We felt that they were genuinely interested and were ready to learn more about this missing chapter of their own history. Then we proceeded to the Jewish cemetery, overgrown with weeds and underbrush. We cleaned the vegetation out around each stone and photographed each monument. 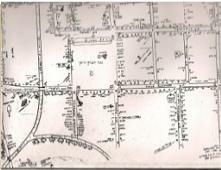 Wayne also spent a fair amount of time creating a map of the remaining monuments and of the grounds. The work was not easy. There were many weeds, the mosquitoes seemed to enjoy us, and the cemetery's size was a little daunting. We met with Antanas again on the following day, as well as with a local newspaper reporter, and enjoyed a guided tour of the Museum. Then we went back to work at the cemetery. We were very surprised to see what seemed to be the entire Vilkaviskis Municipal Parks and Reserves Department there to help us! The work went considerably faster. On Monday we met Mayor Bagusmskas in his office in the Municipal Building. 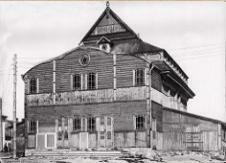 It had been built in 1930 to house the Hebrew Gymnasium, and had not been destroyed in the war. Among the items I had presented to the Museum was a large photocopy of a letter written by Devorah Alexmansky to her brother Zisel, then (1941) living in Cuba. Devorah had escaped the "Aktion," as the Germans called the executions, and was being hidden by a Christian couple, Antanas and Ursula Kampis. The original letter was written in Yiddish. I had come across it in the Vilkaviskis material in the Beth Hatefutsoth materials in Tel Aviv, where it had been translated into Hebrew. My wife, Betty, translated it into English for this article. I am writing this letter and thus I wait to be killed by the murderers. I want to leave you this document in my own hand writing describing who we Jews were destroyed. From all our family only I remain alone like a stone-I move from field to forest and no one lifts a finger to help me. A regulation has been announced that anyone hiding Jews will be shot. This regulation is posted daily in all the newspapers. All the Jews in the neighboring towns have all been murdered. In Kovno and Vilna all the Jews have been killed. In Vilkaviskis there remain a few like me that are in hiding. I am one of the few that still remains alive but I await my bitter death at any moment. Yes the time has arrived when we Jews are destroyed by the hands of these murderers. How can God look at the suffering of our small children? These children who were thrown alive into the pits and then hand grenades were thrown in on top of them! The good God how can you see such things? Tell everyone in America what has happened here. There, sitting in the Mayor's office, was Mr. Leonas Kumpis, born in 1933, the nephew of the couple that hid Devorah. The moment was incredibly moving for me and, I suspect, for him as well. Also present, once again, were local newspaper reporters. After the meeting the Mayor kindly made a minibus available for a tour of what is left of the old town. 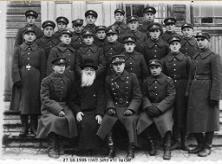 An elderly man, Mr. Stansys Zhenkis, who remembered some of the Jewish inhabitants of Vilkaviskis, served as guide. Mr. Zhenkis actually spoke a little Yiddish himself: even the Gentiles had to speak some Yiddish to conduct business. And Mr. Kumpis showed us the house where Devorah was hidden. We then went to the town square, where the marketplace had been (and still is, but now in the guise of Maxima), and also where many Jewish families had lived, including Wayne's. Remarkably, we were shown several buildings still present in the center of town where Jewish families had lived and worked. They were amidst rather ugly Soviet-era buildings which, in retrospect, had obscured my view during my all-too-brief 2006 visit. In fact, at one point Wayne was quite excited by some old houses in the vicinity of where his family's homes had been (based on Dvora's map). Comparing them to prewar pictures of those homes, the buildings were very similar in construction. Mr. Zhenkis, however, brought us up to date. A small parking lot now occupies the space where Wayne's family had lived, directly adjacent to two prewar buildings. Much of the center of town had been destroyed during the war. Still, I have never seen anyone standing in the center of a parking lot as satisfied as Wayne was that day. After having visited the site of a beautiful old wooden synagogue, now occupied by a bank, we returned to work in the cemetery in the afternoon. Work was becoming a little easier. The weeds had been cleaned out, wee were more experienced, and we had equipped ourselves with a good insect repellant, courtesy of Maxima. That evening we met with a reporter from the Lithuanian national newspaper, Lietuvos Ryas. His English was quite good, giving Victoria much deserved rest. He wanted to know as much as possible about former Jewish life in Lithuania and, since he had never met Jews outside of Stalin's grip, about our perspectives of anti-Semitism and the Holocaust. Two days later our project received a third of a page in his newspaper. On our final day we met with Mrs. Regina Naujokaitiene, a teacher responsible for Holocaust education in the region. By the time we had finished, we had cleaned and photographed about 150 graves. There still remain about another fallen 20 stones. The Mayor said that his office would raise them in the spring. Wayne and I hope that they will be photographed as well, completing the mission. Based on our measurements of the grounds, we estimate that there are about 5,000 tombs in the cemetery, most of which appear to be intact. This would suggest that the Nazis and their collaborators desecrated and stole only the monuments. There were hardly any monuments standing in the part of the cemetery nearest the access road; the ones that remained were in the section nearest to a row of houses. Our guess is that the vandals got to this section last. Based on a photograph taken in 1955, it appears that the cemetery has not been desecrated further since the war, but allowed to deteriorate naturally. If there was no sign of concern for the cemetery's condition on the part of the local people, neither was there any vestige of hostility. Wayne and I took some comfort in the thought that our ancestors' remain are still safely interred, even if we would never know precisely who was where. In fact, Wayne found his great-grandfather's monument intact, an unexpected piece of luck. Since our return home, Wayne and I have been working on the information we obtained from the gravestones. This information, and photographs from our trip, is available at web.me.com/onyaw/vilk.html . 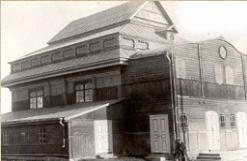 I have also discovered that civil records for Vilkaviskis for the years 1810 and 1811 and Jewish records for the years 1926 and 1939 are located in the Lithuanian State archives in Vilnius. And on a recent trip to Berlin I found that several files on the Jews of Vilkaviskis from the period 1795-1807, when Vilkaviskis was part of "New East Prussia," are in the Prussian State Archives in Dahlem. These may well be the last remaining documents concerning our families and their lives. There is still much to do: the extraction of the material from the Lithuanian and Berlin archives, continued documentation of memories of former Vilnaviskis residents, and the completion of our Vilnaviskis data base. Wayne and I will be busy for years to come, uncovering our past.